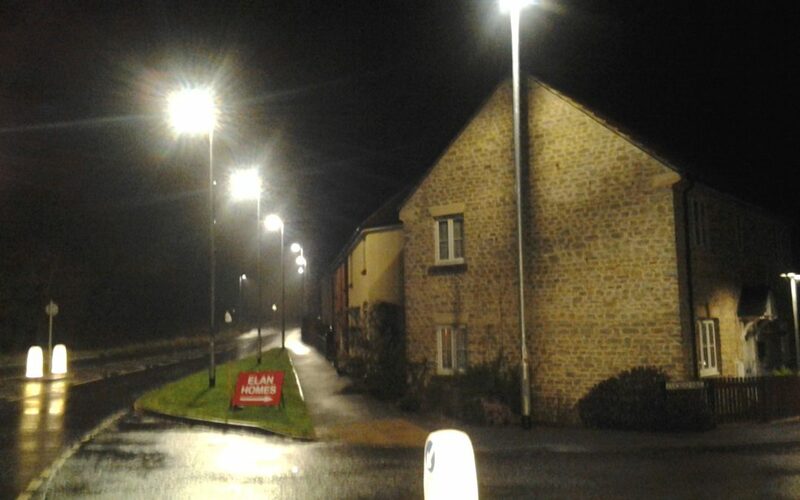 The Town Council has been very aware of residents’ dissatisfaction with the new and very bright street lighting at Cuckoo Hill. On 31 March 2017 Cllrs Mike Brownlow and Ewan Jones, together with the Bruton Trust met with Phil Green from the County Council’s Highways Lighting Team to discuss the concerns. The meeting was attended by Cllrs Mike Brownlow and Ewan Jones, Ed Tickner from the Bruton Trust, and Phil Green and a colleague from Somerset County Council’s Highways Lighting Team. The meeting was arranged in response to numerous complaints to the Town Council, and much talk on Bruton’s Facebook page about the brightness of the lighting up at the junction of the A359 and the entrance to the Cuckoo Hill estate. Mr Green explained that because there’s a large bollard in the road and a turning, this is designated as a ‘Conflict Area’, and is subject to strict lighting rules, decided on by the classification of the road. The lighting must be as even as possible to avoid motorists driving into and out of light and dark areas, hence the height of the columns, and their large number. The lighting columns are as high as they are because even more lights would have been necessary to achieve the same effect, had their height had been lower and for the area to still comply with BSI standards. (BS5489 2013) Any roundabout, junction, speed bump etc. has to be lit to these kind of standards now. It was explained that this is all driven by costs. The lights could be run at a lower wattage — they are currently set at 4,000 kelvins on the Kelvin Scale, entering the blue end of the spectrum and producing a harsh light with a lot of glare. Were they to be set at 3,000 kelvins, it would result in a warmer light with a lower level of brightness. However, counter-intuitively, it would cost the County more to run the lights at this lower level than at its present setting, due to the design of this generation of lights. This admittedly “brighter than would be ideal” setting of 4,000 kelvins was decided on by County Councillors as being the best compromise, giving a good level of luminescence with a good level of energy saving. Other councils, such as Gloucestershire (encompassing the similarly rural setting of the Cotswolds, and just as starved of cash as Somerset is), set their lights at 6,500 kelvins in order to save even more money. The lights could be dimmed or even switched off at certain times of the night (called Park Night). However the energy companies keep a close eye on this practice, and if they see they’re losing money, they put their prices up to compensate. This has already happened several times, and if it makes anyone else angry, I can only agree with them. Furthermore, if you switch off individual lighting columns for longer than a few months, they are permanently disconnected at considerable cost. Nonetheless, Phil Green reckons that after having installed 18,000 LED street lights across the County so far, SCC has saved in the region of £515,000 in running costs. So the conclusion is that it’s cheaper to keep the LED lighting at Cuckoo Hill and elsewhere burning at this bright level all night, rather than dim them or switch them off. There are big costs involved in turning the brightness down.